The doomed Phobos-Grunt spacecraft fell from space on Jan. 15, and crashed near the South American coastline – with any debris probably falling into ocean waters, according to a European Space Agency (ESA) update released today (Jan. 25). But "probably" can also mean that some free-falling fragments might have reached land. However, there have been no confirmed reports of debris reaching land. 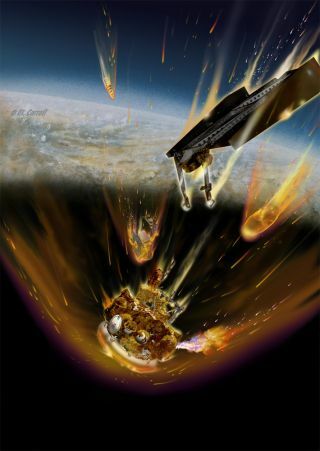 "While this was an uncontrolled re-entry, the location of the potential impact area was largely over ocean, with a correspondingly low probability of any detrimental effects," said Heiner Klinkrad, head of ESA’s Space Debris Office in Darmstadt, Germany, in a statement. Klinkrad told SPACE.com that the associated re-entry location of Phobos-Grunt "is in the vicinity of the South American coastline." When asked about the delayed publishing of the Phobos-Grunt re-entry data, which came more than week after the spacecraft actually fell, Klinkrad said, "I cannot comment." Following Phobos-Grunt's fall from space, the U.S. Strategic Command confirmed a re-entry time of 12:46 p.m. EST (17:46 GMT) as the spacecraft was flying about nearly 50 miles (80 km) above the South American coast at a location of 46 degrees south and 87 degrees west. "This corresponds to a pass at 10 km altitude about seven minutes later – very close to ESA's prediction," according to the ESA update. That seven-minute time delay is roughly how long it took for Phobos-Grunt to fall from a 50-mile altitude to altitude height of about 6.2 miles. Phobos-Grunt tipped the scales at nearly 14 tons, with the bulk of that weight consisting of toxic unsymmetrical dimethylhydrazine (UDMH) and nitrogen tetroxide fuel. Russian experts that assessed the re-entry survivability of Phobos-Grunt stated prior to the craft’s destructive fall that about 20 to 30 fragments would reach Earth’s surface. It was estimated that less than 200 kilograms — some 400 pounds of hardware — would survive the plunge. Phobos-Grunt launched into space on Nov. 8 (Nov. 9 in Moscow) on a mission aimed at landing on Phobos, one of two moons circling the Red Planet. Grunt means "soil" in Russian, and the probe was built to collect samples from Phobos and return them to Earth by 2014. In addition to the Phobos-Grunt re-entry data provided by the U.S. Strategic Command, other information on the spacecraft's fall to Earth has been gleaned from European sources, including France and Germany. All of this data was used to refine the re-entry estimates, ESA officials said. "Within the expected uncertainties, the prediction has been largely confirmed by observations," they added. As the errant Phobos-Grunt circled Earth prior to its demise, ESA officials sent regular updates to European civil protection authorities prior to the probe’s fiery re-entry, the space agency said. The U.S. Strategic Command operates a network of radar and other sensors — including space-based assets — that collectively track objects in orbit as well as scan for objects that plunge into Earth's atmosphere. The final report regarding the Phobos-Grunt re-entry was posted yesterday (Jan. 24) on the U.S. government's Space-track.org website that provides access to U.S. Air Force Space Surveillance data. That website shows that the failed Russian probe (classified as Object 37872) made 1,097 orbits of Earth prior to its re-entry at 17:46:00 GMT, plus or minus one minute. The posting shows a predicted decay location of 46 degrees south, 273 degrees east. Another group that took an active role in predicting the fall of Phobos-Grunt was the Inter-Agency Space Debris Coordination Committee, IADC for short. This is a technical forum for the worldwide coordination of activities related to human-made and natural debris in space. IADC is an interagency group with member agencies that include ESA, NASA, European national agencies and the Russian, Chinese, Canadian, Japanese, Ukrainian and Indian space agencies. Since 1998, a number of targets have been used for IADC re-entry campaigns. The Phobos-Grunt re-entry was the third major spacecraft to fall from space in recent months. It followed the crash of a dead German X-ray space observatory in October and the re-entry of NASA's defunct Upper Atmospheric Research Satellite in September. Data-sharing between countries has helped to sharpen skills to more accurately calculate the re-entries of spacecraft, rocket stages and even discarded hardware from the International Space Station.